Have a splashing-ly good time without any worries with this promotional waterproof phone case. Keep reading for more on this great product. This case is a perfect multi-purpose product for all events your clients are likely to attend. It can be used to store electronic mobile phone devices or tablets. The case is made of PVC. It is sealed at the top and prevents water entering the case. The PVC promotional waterproof phone case can as a result be used to safely store your device for all your water related events. You are able to conveniently transport your device anywhere with the attached neckband. It can be worn around your neck or the size can be reduced to fit your wrist. The case also allows you to operate your device. So that you are able to still call, listen to music, etc. The case is also transparent enough to take photos and videos. Perfect for taking a photo or a #selfie on the beach, or could be used at water related activities such as kayaking. This case can also be used for skiing but there is also the opportunity to use it for festivals or at water amusement parks. Can also be used to protect your mobile device from scratches and scuffs dependent on force applied. 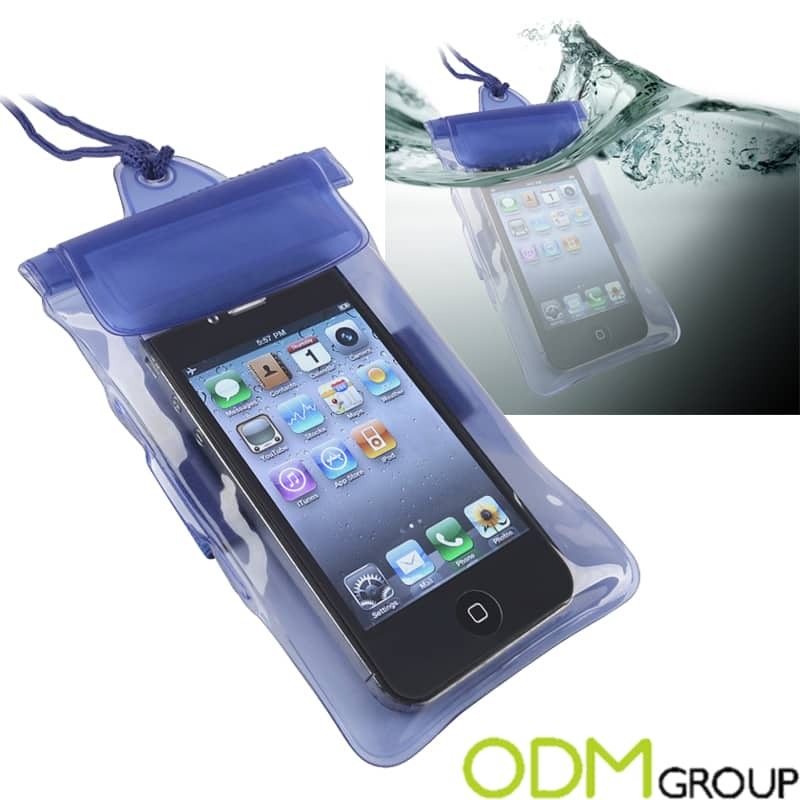 The promotional waterproof phone case as well as the lanyard/ neckband can be customised to display your company logo. Whilst visiting a water themed, theme park called Lost City. It was recognised that many visitors were wearing this in order to conveniently keep their devices and valuables safe. It could be suggested that if these were branded they would raise brand awareness. As personally when we saw this promotional waterproof phone case. We were interested and saw this product to be desirable for its function.This is however, a great potential branding opportunity missed. This promotional waterproof phone case could also be given as a promotional gift to festival goers. It allows them to easily access their electrical appliance. Enables them to record their experiences at the festival. Without having to worry about it getting damaged or fear from dropping their mobile device. Could also be a Gift with purchase with swimwear. Similarly can be used with various exercise types such as cycling or running. These are just some suggestions. However there is a large scope for how this product can be used apart of a promotional campaign.